Nothing is more important than the way you finish and the way you start the turn. 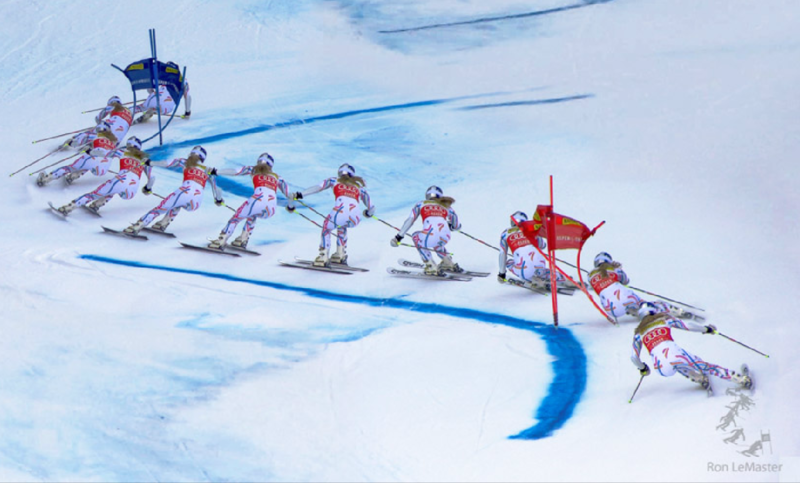 We'll continue the series of technical posts on GS or Giant Slalom with a look at the different transition types. Although we discuss these in the context of the GS turn, these are very useful in all sorts of skiing situations, all over the mountain and in other events. A transition encompasses the release of the previous turn, getting across the corridor and the onset of the next turn. It is critical for all high level racers and high level skiers to have complete understanding and mastery of all these transitions, to be able to use either, depending on the situation. Note: We'll use more video for this article, to progress from static photo analysis - skiing is not a sequence of static poses, but a fluid and flowing dance on skis. These here are some of the best 3 GS videos I have seen - if you are a student of skiing, you should watch these until your eyes hurt. This is a typical high performance transition, starting with a Flexed release, where both skis are unweighted and are floating to the other side, as the body keeps moving forward. At the same time, the skis are tipping to the new edges. This is classical outside ski to outside ski skiing. The unweighted skis are important since that makes it easy to pull them back and re-center the skis under the hips (or the body over the skis, have it your way). An unweighted ski is also easy to tip into the new turn, as we discussed before - in Lindsey's photo, see how long she waits to put pressure on the outside ski: it's just above the gate that there is any snow spray. Just a quick question: after watching the video of Mikaela, above, how many times is she tall in the transition? This is the classical "Ted Ligety release", or the early release, where you retract the old outside ski and the weight moves to the new outside ski so early that it is still on the uphill edge (i.e. the "wrong" edge). This sure gives new meaning, I guess, to the old phrase of "outside ski to outside ski", doesn't it? Establishing early balance on the new outside ski is very important and allows much bigger angles to be created above the fall line. You can listen to Ted talk about moving onto his new outside ski while it is on the other set of edges and about the resulting smoothness of the transition, at about 1:57 into the video. Because the body is suddenly leveraged against the "highest" edge, it will very quickly transition into the turn and establish early angles. This is a way to quicken the transition. If you look very carefully through the transitions above, you will see that often she will lift the old inside foot in the transition, keeping the weight on the old outside foot throughout the transition. Note however, that the leg is flexed and tipped massively inside the turn, albeit weighted all the time. This is another type of transition in GS, with its own benefits. As the leg is strongly flexed (i.e. you give into gravity), it can also very quickly move the body over the skis into the new turn, just as the skis are tipped into the new turn resulting in the establishment of early angles. Viewed 1277 times ( | Print ) this page.